<!- Main Mody here --> Chuck Missler observes that "The great discovery which opens the Bible to us is that these 66 books, written by 40 authors over thousands of years, are an integrated message system. Every detail--every number, every place name, every allusion--is there by careful design and is significant". Jesus Himself said "Think not that I am come to destroy the law, or the prophets: I am not come to destroy, but to fulfill. For verily I say unto you, Till heaven and earth pass, one jot or one tittle shall in no wise pass from the law, till all be fulfilled" (Matthew 5:17, 18). This insight unlocks a number of discoveries which otherwise would escape the notice of someone who takes the text less seriously. Let us consider the numbering of the Tribes of Israel? In Numbers chapter 1 we encounter the numbering of the people. Why? Of course, there are valid historical reasons for the inclusion of this detail in the Torah (the five books of Moses). But if we examine these details more closely, some remarkable insights emerge. When Moses received the Ten Commandments on Mt. Sinai, he also received detailed specifications and instructions for the building of a portable sanctuary, the Tabernacle, or tent of meeting. ( Exodus 25-27, 36-38, 40) The purpose of this unusual facility was to provide a place for God to dwell among His people. The tabernacle was always set up at the center of the Camp. The tribe of Levi was assigned to care for it, and encamped around it. Moses, Aaron, and the priests camped on the east side next to the entrance. The three families of the tribe of Levi (Merari, Kohath, and Gershon), camped on the north, south and west side, respectively. The remaining twelve tribes were grouped into four camps around the Levites. It is helpful to realize that there were really 13 tribes, not "twelve." Jacob had twelve sons, each becoming the founder of one of the twelve tribes. However, Joseph was sold into slavery and subsequently emerged as the prime minister of Egypt ( Genesis 41:37-41). In Egypt, Joseph married Asenath and had two sons, Manasseh and Ephraim. When Jacob and the rest of the family ultimately came to Egypt, Jacob adopted his two grandsons as his own (Genesis 48). With the tribe of Joseph in two parts, there are in fact 13 tribes with Joseph having a "double" portion among his brothers. The twelve tribes of Israel (Jacob) are listed twenty times in the Old Testament and once in the New Testament. (Genesis 29, 35, 46, 49; Exodus 1; Numbers 1:1-15, 1:20-43:2; 2:7, 10, 13, 26, 34; Deuteronomy 27, 33; Joshua 13ff; Judges 5; 1 Chronicles 2:1, 2:3-8, 12, 27; Ezekiel 48, Revelation 7) Each time they are listed in a different order. The Levites were exempt from military duties. When the order of military march is given, there are still 12 listed, excluding Levi. How? By dividing Joseph into two: Ephraim and Manasseh. The twelve remaining tribes, excluding the Levites, were clustered into four "camps." (Numbers 2) Each of these groups, of three tribes each, were to rally around the tribal standard of the lead tribe. Judah's tribal standard was, of course, the lion. Reuben's ensign was a man; Ephraim's the ox; Dan's, ultimately, the eagle. These are detailed in the following diagram. 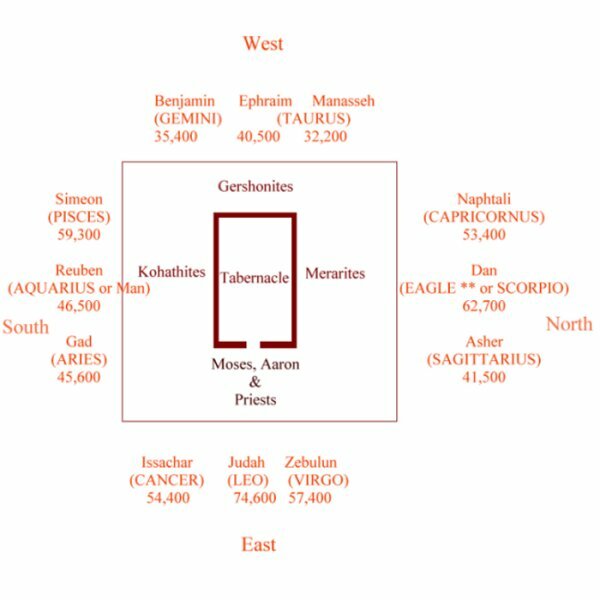 It may come as a surprise to many to learn that each of the 12 tribes were associated with one of the constellations of the mazzeroth (the Hebrew zodiac.) We know these by their post-Babel names after being corrupted by pagan traditions. By learning the Hebrew names, and the names of the principal stars in the order of their magnitude, we discover they portray the entire redemptive plan of God--from the virgin birth (Virgo) to the triumph of the Lion of the Tribe of Judah (Leo). It is interesting to note that these four primary tribal standards--the lion, the man, the ox, and the eagle--are the same as the four faces of the cherubim encircling the throne of God, (Ezekiel 1:10, 10:14, Revelation 4:7 Note: some feel that the seraphim in Isaiah 6 are the same. ) we notice these strange living creatures, somehow associated with the protection of His throne, His holiness, etc. The numbering of the tribes is detailed in Numbers chapter 1. The actual population represented is obviously somewhat larger than these enumerations, since only men over twenty, able to go to war, were counted. Most analysts assume that women, children, and the elderly, would multiply the count by some factor: 3 or whatever. The total camp would thus appear to approximate two million. We can only guess at how much space was required by the Levites, whether it was 100 m on a side, 1000 m, or whatever. But whatever it was, we'll view that length as a basic unit. To fully appreciate all of the implications, we must adopt a very literal view of the text. The tribes of Judah, Issachar, and Zebulun--collectively called the Camp of Judah--had to encamp east of the Levites. This poses a technical problem. Notice that if the breadth of their camp was larger than that of the Levites, the excess would be southeast or northeast, not east. Therefore, their camp could only be as wide as the Levites, and they then had to extend eastward to obtain whatever space they required. The camps of Reuben, Ephraim, and Dan had the same constraint on the south, west, and north, respectively. The length of each leg would be proportional to the total in each camp. 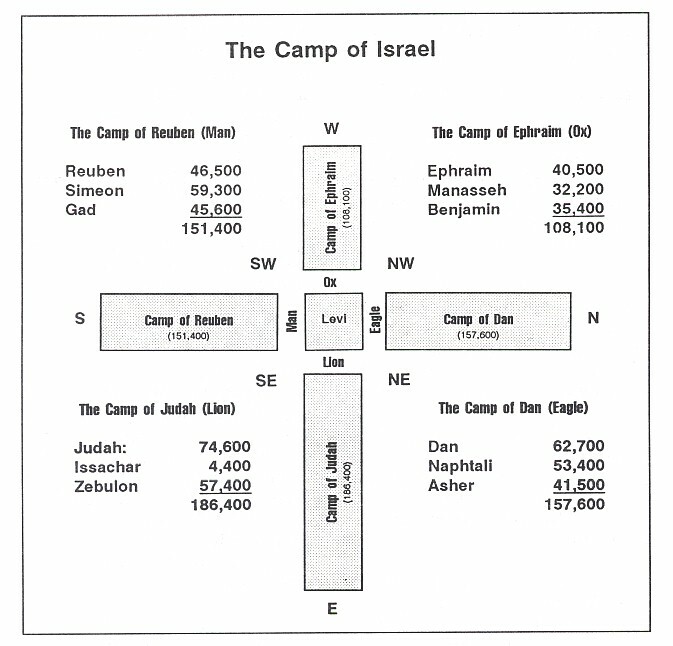 If we assemble what we can from the text, we can imagine what the camp of Israel looked like from above: the tabernacle and the Levites in the center, surrounded by the four faces of the tribal standards, and each of the four camps of Judah, Ephraim, Reuben, and Dan, stretching out in the four cardinal directions. We can also tally the size of each tribe to total the relative length of each camp as they stretched out in each of the four directions. The plan view is shown below. Created: 23 - Jan - 1997. Last modified: 26 - Apr - 2000. Copyright � 1998, Graham Brodie.